THE WORLD LISTENING PROJECT (WLP) is a not-for-profit organization devoted to understanding the world and its natural environment, societies and cultures through the practices of listening and field recording. World Listening Day was brought to my attention when my local NPR station, KUOW, did a program featuring the Seattle Phonographers Union on the “Sound of Summer” (this is a good show which you can listen to in its entirety via this link). A handful of the Phonographers were present in the studio, including local sound hero Chris DeLaurenti and Steve Peters, the force behind the Wayward Music Series. They played sounds sent in by listeners and did some live mixing of those sounds as well as ones that they had brought with them. This later activity was of particular interest to myself as a number of years ago I became quite interested in the concept of truly treating field recordings as sound and thus as material for improvisation. In the world of field recording you tend to get a couple of stances (with of course plenty of variations) which for the sake of simplicity we’ll just refer to as documentary and constructed. Those who advocate for documentary field recording prefer unedited, untreated, pure recordings that are of interest in and of themselves. The recordist of course is an integral part of the process via choice, mic placement, selection of segment presented and so on, but philosophically the notion is that with this minimum amount of intervention there is a wealth of interesting, intriguing, unique sounds to be had. The later category in contrast considers field recordings as a source for sounds from which collages of sound, perhaps not entirely field recordings can be assembled into a greater whole. This of course can range from an almost documentary approach but with some basic manipulations all the way to musique concrete. I personally think that there is much to be said for both approaches but that the pure documentary approach is the most limiting and has had the smaller amount of success. That is to say that pure documentary field recordings are often merely auditory tourism and while there may be some interesting sounds and such they tend to generate a pretty fleeting amount of interest. The pure field recordings that bring you back to theme time and time again are a real rarity and I think takes incredible skill from the recordist. The people who make these field recordings, of course, find a huge amount of sounds completely captivating and this I think makes it harder for them to discriminate. Of course the world of constructed field recordings is also rife with its problems: abuse of effects (particularly reveb and echo effects), insertion of taste (which can be poor), reliance on tropes (children playing, rain, “clever” spoken fragments) and so on. But I personally think there is a lot more potential there and of course have dabbled in the area myself. This all began for me in about 2003 with what I dubbed my “Out of Doors” series. The concept behind this series was to play acoustic improvisations outside in such a way that ones sounds mix naturally with the environmental sounds. In this I was inspired by the Annual Summer Concerts of Sean Meehan and Tamio Shiraishi (of which this is the best description) and a passage quoted in David Toop’s Ocean of Sound about Brian Eno trying to learn to perform a field recording. I was never that happy with any of these performances but it was mainly due to lack of skill playing purely acoustically at that point in my career. The most successful recording from this period was actually the first one I did where I just stuck a pair of mics out my apartment window during rain storm and did live processing on it (Released as Rain&Train which can be downloaded here). After the next few summers engaging in the Out of Doors project I started the Seattle Improv Meeting to work with graphic and textual scores and the intersections of improv and composition. We explored many different notions of guiding improvisation and during the course of this I recalled that Brian Eno quote that got me interested in the out of doors stuff to begin with. I really wanted us to start playing outside and try to do more what I was doing with the Out of Doors project – that is try to improvise with the natural sounds. We finally did this in August of 2007 in my backyard in Kirkland WA. In this recording we begin by playing Christian Wolff’s Stones, and gradually segue into improvisations with the natural environment. Of course being in an urban/suburban setting the sounds of cars, airplanes and people are prevalent but a small wooded area beyond my backyard is also the home of many birds, insects and of course make their own sound. This was I felt a successful first foray into this concept and was something I wanted to further purse. But frankly here in Washington State the only really feasible months for this sort of thing are July, August and September so instead I proposed that we all make our own field recordings and then use them as sound sources for improvising. This is basically what the Seattle Phonographers Union do, though I had yet to see them perform (even though I’d been aware of them for years I sadly never saw them perform until just last year). I spent a couple weekends with my DAT recorder on Whidbey and Fidalgo Islands plus my own backyard making several hours of recordings. I then edited these into various fragments of varying length and copied them onto three iPods. To this I also added recordings I had made of an oscillator, white noise, eBow my my harp and other little pure abstracted sounds. The three iPods were attached to a little mixer along with a room mic that I used almost as an effect; right on the edge of feedback it’d create this hollow sound like a very short echo. Before playing with the group I wanted to see if my concept would work at all and I improvised a short piece that I later dubbed Midnight Layers which you can listen to via the player below or download in various formats (flac, alac, mp3). We did end up having several sessions where we played with our recordings though I don’t think the original idea I was trying to communicate was really realized. That is I think I presented this as playing premade samples as opposed to field recordings so a lot of what you hear from the others are instrument, pure sounds and the like. While I did intend a mix to some degree (recall of course the pure tones and the like that I’m using) I was thinking the emphasis would be on natural sounds. Still interesting results and you can hear much of the same sound set that I was using in Midnight Layers in a different context. These two session are documented on the SIM 2007 Archive pages in the November and December entries as Layered Recordings I and II. In my own explorations of this area this whole period was quite fruitful in that it led me to the notions of overlays and assemblages which I used to construct an album entirely from field recordings I made in Japan in the autumn of 2008: Sounds from the Floating World. I came up with the idea of overlays even before I flew to Japan, and this idea is simply the notion of improvising along with field recordings. I had decided to bring along a small recording device to Japan and as I thought about what to do with the field recordings, in context of all the other actions described here I thought this would be a particularly interesting notion. The sounds in Japan were fascinating and I recorded a lot, as the device I was using was this tiny voice recorder that I could leave in a pocket and allow to record without interference. It wasn’t the most high quality device, though not terrible (it recorded to 16bit WAVs but at a rather low sample rate). A better system for this type of recording is definitely something I’ll invest in for future excursions. On returning from Japan these recordings sat on my harddrive until I was invited to perform in a benefit for the Seattle Improvised Music Festival. For many years they’d do this prior to the festival; have a bunch of local musicians play a “one minute solo” as a fundraiser. This year I decided to create a one minute piece which I’d then improvise over. 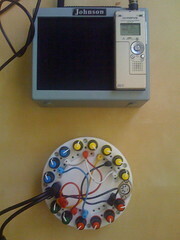 Thus was the notion of an assemblage developed: a piece that is created out of field recordings used as sound sources. This initial assmblage can be listened to above or downloaded in lossless formats from the Sounds from the Floating World page. The setup I used for the show is the one you can see to the right: my voice recorder, my Chimera BC-16 and a little amp (though I ended up using a slightly bigger one for the gig as that one is a bit wimpy for the Chapel). This inspired me to make the rest of the constructions released as Sounds from the Floating World which I have just recently put up for download in its entirety. 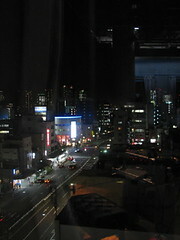 The album is made up of three assemblages and one overlay and is an interesting document of my trip to Japan. It is far removed from aural tourism in that there are three structural elements to the three main pieces and several ideas that each was created around. And yet the sounds of Japan from gardens, parks, temples, arcades, trains and so on are a mix of the unfamiliar, the slightly off, the unexpected and so and are engaging in and of themselves. While as with everything it will appeal to everyone in different degrees, it definitely shows how varied the approach of construction can be. You can set aside some time when you pay attention to your soundscape. You can organize a listening party when people play field recordings. You can organize a soundwalk. I offer the above selection of musics made in and about the natural world as my contribution and I urge you to get out there and listen for yourself. For myself I’m going to give Sean Meehan & Tamio Shiraishi’s Annual Summer Concerts record a spin and then head outside to listen to this fine July day in Washington State. A Spiral Cage is powered by	WordPress 4.6.14 and delivered to you in 0.319 seconds using 24 queries.